There will be spring. There will be summer. And thus there will be potato salad. 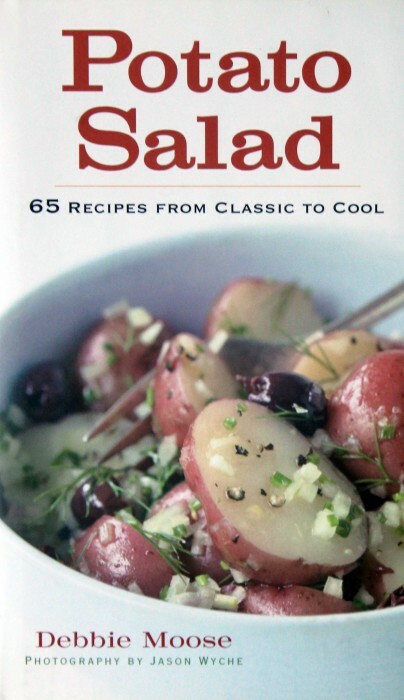 From 2014, here’s the bible of potato salads. There is a hotel near us upstate — the Emerson — with a gift store that Suzen and I often visit. There is an exceptional blend of good things here: clothing, jams, dinnerware, coffee, and cookbooks. Suzen looks at her things and I look at mine. We do share coffee and we do find little cookbooks gems that we’ve never encountered. Potato Salad was published in 2009 but I just never saw it anywhere. It’s one of those small, slim volumes that can get “lost” on bookstore shelves. It might be on display, but it can be missed in a crowd. At the Emerson, it seemed to occupy a prominent spot, not crowded out and not shuffled to the side. I’m delighted I found it. Inside, you will find 65 very diverse recipes. Yes, it’s fall, but I consider potato salad to be a year round treat. That is not how I was raised, I admit. Potato Salad Season began the Monday after Easter. The hardboiled Easter eggs would be broken open, color shells discarded, and the egg contents applied to a giant bowl of potato salad. The Season ran from Easter to Labor Day and then, like white clothing, ended. She is the author of Buttermilk: A Savor the South Cookbook, a book I have blogged about here. The best buttermilk cookbook, period. Have you ever had even one of these? Ever imagined one? Potato Salad is a lovely book filled with ideas that will turn your table around. There is life beyond hardboiled eggs + mayo + celery. I think I need to send a copy of this book to my mother. She’s 90 but she still cooks. Of course, I’ll have to wait until Easter.